The Detachment Member Training & Development Committee will be delivering the following training / course. The course is made up of 8 units that will cover many things relating to the Sons of The American Legion. 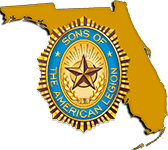 Items that will be covered include a video history of The American Legion an overview of the history of the Sons of The American Legion and the accomplishments of the Florida Sons. Additional units will cover the responsibilities of Squadron Officers, an overview of running a Squadron Meeting, programs supported by the Sons, membership and the Sons reporting requirements. We will end the day with a roundtable question & answer session. There is no fee to register for this course and an online registration form is available on our website at – https://goo.gl/forms/DQT4WwaYLBF2Bc122 – Registering online will guarantee the student will have seat in the class. Students that attend the class will get their certificate sent electronically, via e-mail, after the class. Students must be in class for the entire class to receive the certificate. The MT&D Committee has indicated that there is no limit on how many can attend, but we need at least 20 members to register in order for the Detachment to conduct this course. This course is being hosted by Sons of The American Legion Eastern Area and is open to all members of the American Legion Family who wish to attend.